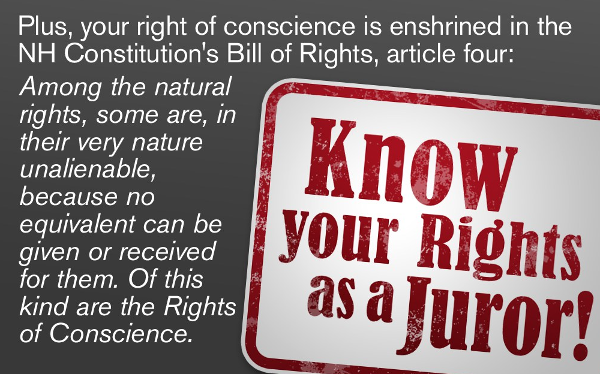 We will be handing out juror rights flyers to potential jurors in March and April. 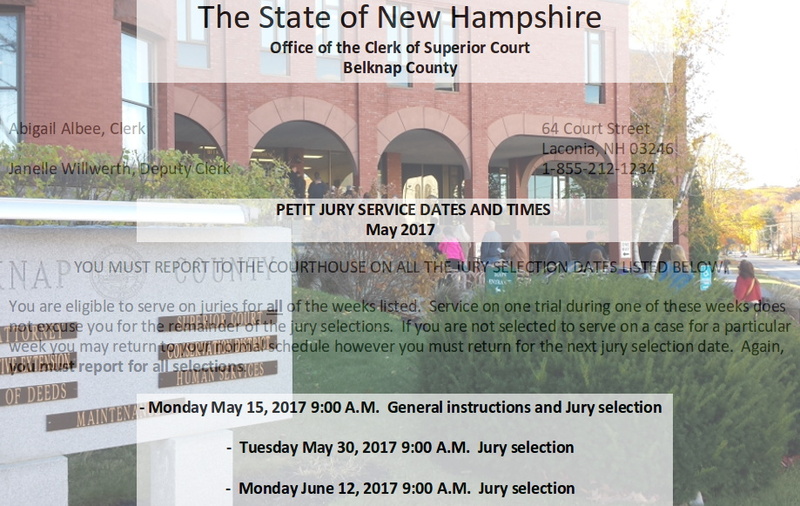 Dates for the March 2018 jury pool; March 19, April 2, and April 16. We will start at 8:30 and likely cross the street for a coffee at 9:00. For fun and prizes, share this post to social media. Be the first to share, and leave a comment here to claim your prize. 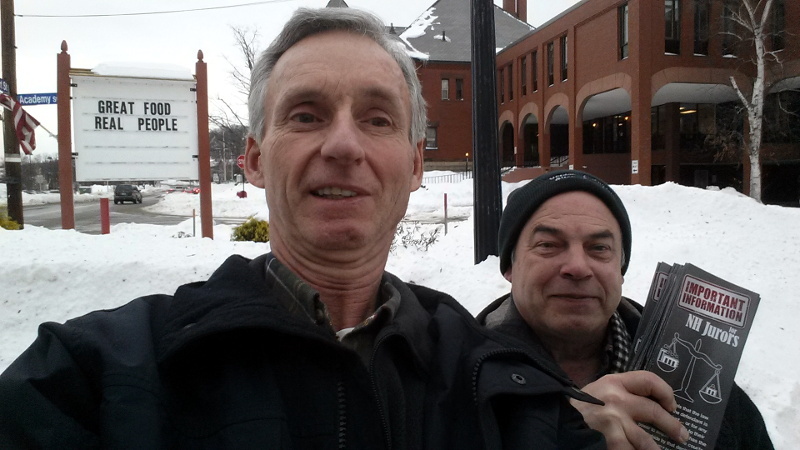 Glenn and I enjoyed the relative warming, into the teens, and handed out 45 flyers to potential jurors. 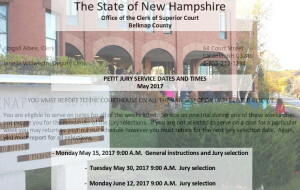 NH Constitution from Jury Information flyer. 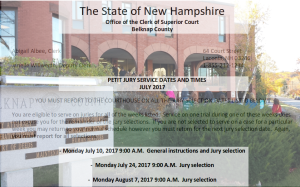 Belknap County Superior Court will assemble a new jury pool on January 8, 2018. We’ll be there to distribute some helpful information on the juror’s rights. We’ll be handing out flyers starting at 8:30. We’ve been out regularly, every other week for each pool, for longer than I can recall. If you’d like to contribute to the effort we’ll be happy to accept a small donation. Bitcoin let’s you send funds with a minor transaction fee. Well that was the idea of Bitcoin. Now SegWit bitcoin cost $20-30 in fees, screw that. With Bitcoin Cash your transaction fee is less than a dime! 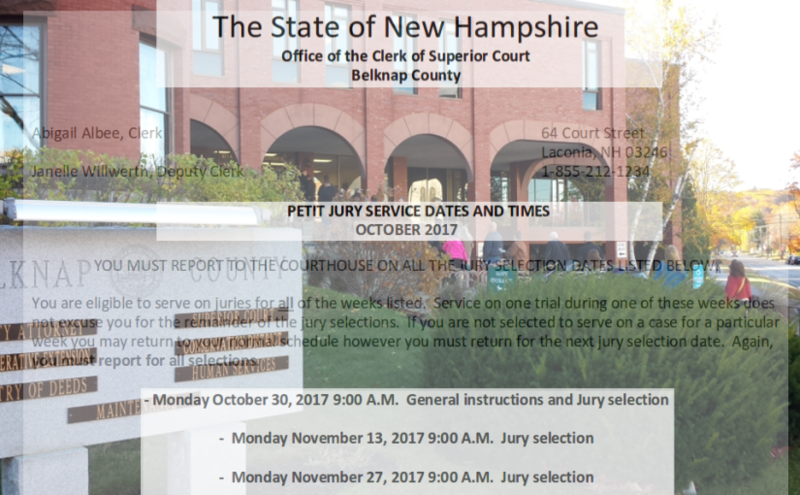 Belknap County Superior Court will assemble a new jury pool on October 30, 2017. We’ll be there to distribute some helpful information on the juror’s rights. We’ll be handing out flyers starting at 8:30. We’ve been out regularly, every other week for each pool, for longer than I can recall. We need to restock on flyers. If you’d like to contribute to the effort we’ll be happy to accept a small donation. Bitcoin let’s you send funds with a minor transaction fee. Well that was the idea of Bitcoin. Now SegWit bitcoin cost $2-3 in fees, screw that. Mike and Glenn inform jurors of their rights. 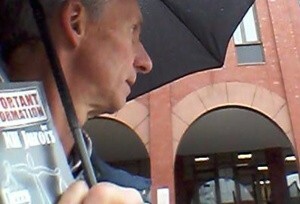 September 18, 2017 – Another 20 jurors received information on their rights. This was the second trip to the courthouse for this jury pool. On the first outing 40 potential jurors picked up a flyer. This panel will return in another 2 weeks and we’ll be there to see if we missed anybody. Litter pick-up – July 9, 8:00 a.m.
Jury outreach – July 10, 8:30 a.m.
County meeting – July 11, 7:00 p.m.
With the Independence Day celebrations behind us, it will be time to tidy up after the parties. We’ll start with a breakfast at Shooter’s Tavern at 8:00 then hit the road. We had a great turn-out for our last clean up and the job was done quickly. A couple of the regulars will be away so please make an extra effort to come out and give us a hand. We are usually done within a couple of hours. 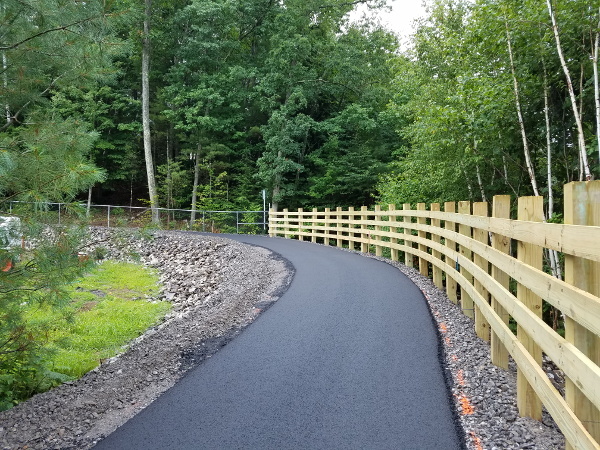 We will also be making a pass through the Lake Winnisquam Scenic Trail. A new jury pool will be starting their service on July 10. 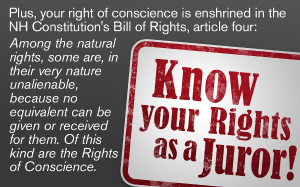 We continue the year with Rights Brigade in a juror information blitz. 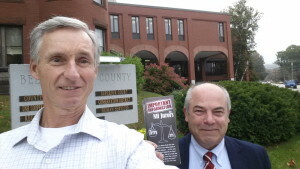 We will greet jurors at the Belknap Superior Court in Laconia at 8:30 with a nice pamphlet loaded with information that the court will not provide to them. 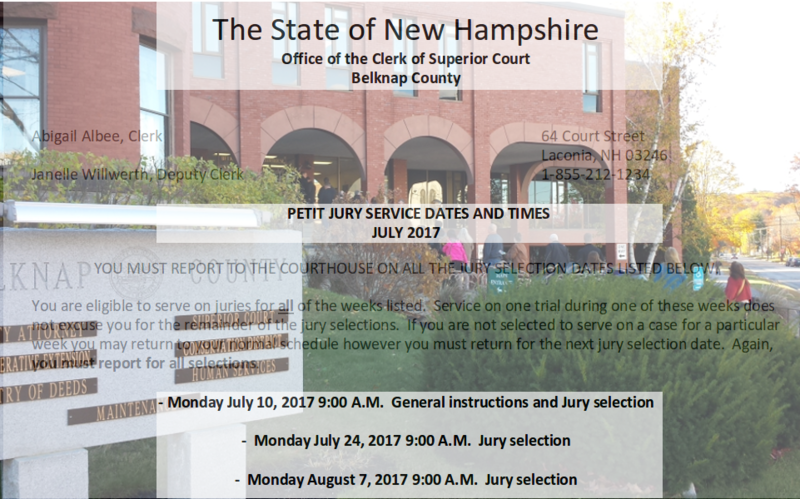 The jury pool is scheduled to return on Monday July 24 at 9:00, and Monday August 7 at 9:00. We will start a half hour before the jurors are scheduled to arrive. At times the jury is dismissed from the secondary dates in the event that trials are postponed. Call the court (1-855-212-1234) to check on the status prior to coming out on July 24 and August 7. 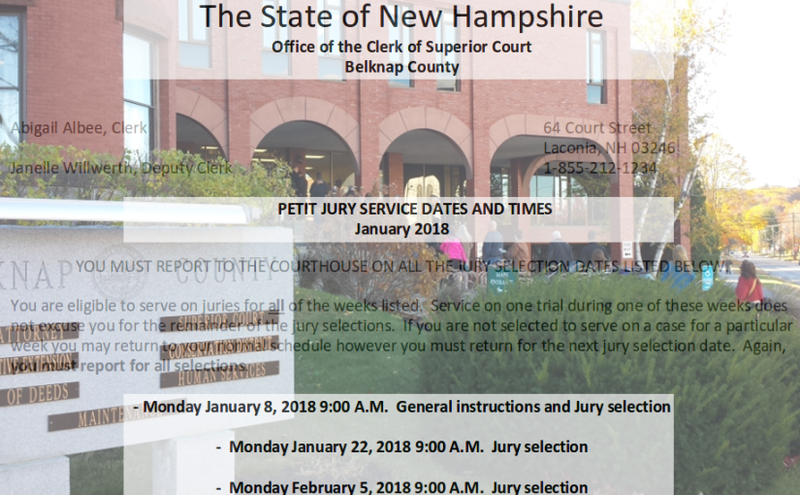 Jury duty dates and times. The Belknap County Delegation will meet to appoint a County Attorney to replace Melissa Gulbrandsen as she has resigned to take a judgeship with the court system. Our monthly meeting continues; same time, same place! 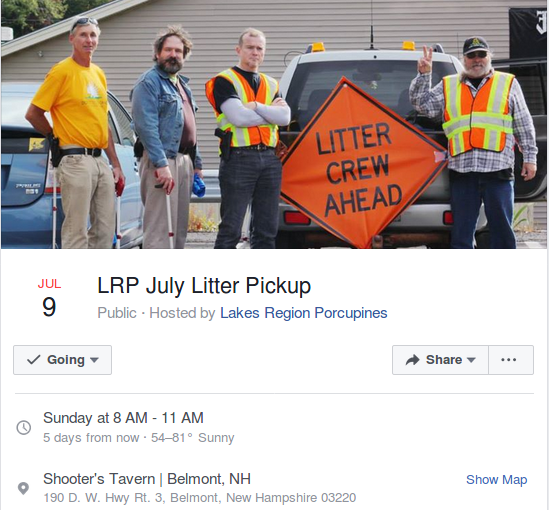 The Lakes Region Porcupines meet on the third Saturday of each month. 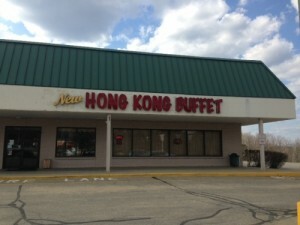 We meet at noon at the New Hong Kong Buffet in Belmont, NH. We usually meet in the room behind the entrance. We often have a dozen folks come for the meeting and discuss a variety of liberty issues. This is an informal and casual get together. 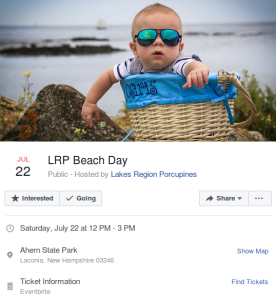 LRP Beach Day is coming up on Saturday July 22 at Ahern State Park. The 3rd Annual LRP Beach Day BBQ and fundraiser goes to the dogs! Super Doge Activist Lola the Wonder Dog has taken over this event and is ensuring that our four legged friends have a beautiful day in the sun and surf. As such, this year our proceeds benefit Lakes Region Humane Society and all dogs are welcome at Ahern State Park! Please note, dogs are welcome to bring their humans along for burgers and potato salad! All we ask is a small donation of $10 per eating adult. Kids eat for half price. If you feel that you can’t afford to eat with us, we still ask that you come along and if you feel up to it, drop a few bucks in the hat. 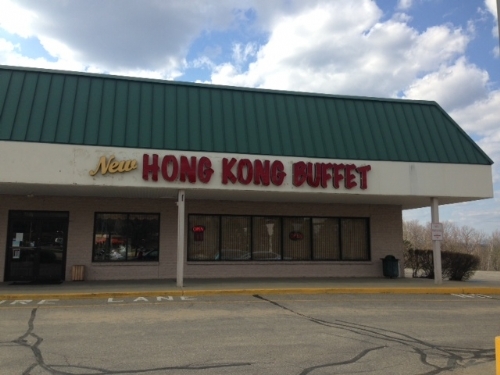 Save up now, as you’ll regret not sampling some of Glen Aldrich’s World Famous Potato Salad! Let us know that you are coming through Eventbrite, so we’ll have plenty of food. We’re looking forward to seeing you! Jury outreach – May 15, 8:30 a.m.
Litter pick-up – May 21, 8:00 a.m.
County meeting – May 22, 7:00 p.m.
A new jury pool will be starting their service on May 15. We continue the year with Rights Brigade in a juror information blitz. The jury pool is scheduled to return on Tuesday May 30 at 9:00, and Monday June 12 at 9:00. We will start a half hour before the jurors are scheduled to arrive. At times the jury is dismissed from the secondary dated in the event that trials are postponed. Call the court (1-855-212-1234) to check on the status prior to coming out on May 30 and June 12. It’s time for our spring cleaning. We’ll start with a breakfast at Shooter’s Tavern at 8:00 then hit the road. We are usually done within a couple of hours. We be making a pass through the Lake Winnisquam Scenic Trail. 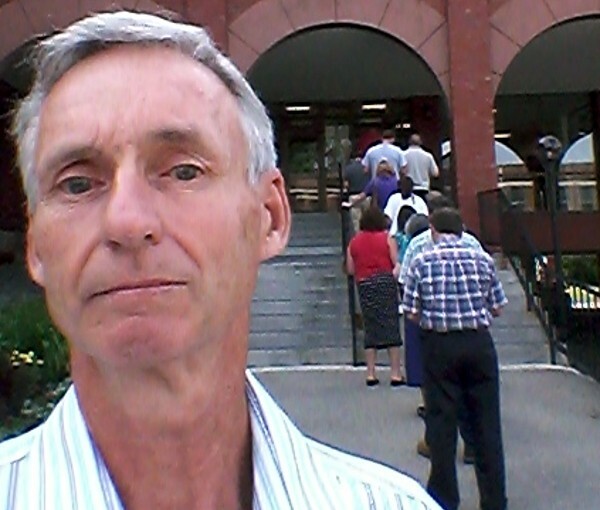 The Belknap County commission continues to claim they do not have enough money to run the county and are asking for a supplemental appropriation. If your taxes are not high enough, stay home. If you think you’re already paying enough, come out and show your support for the representatives that are taking the heat for actually trying to limit government. 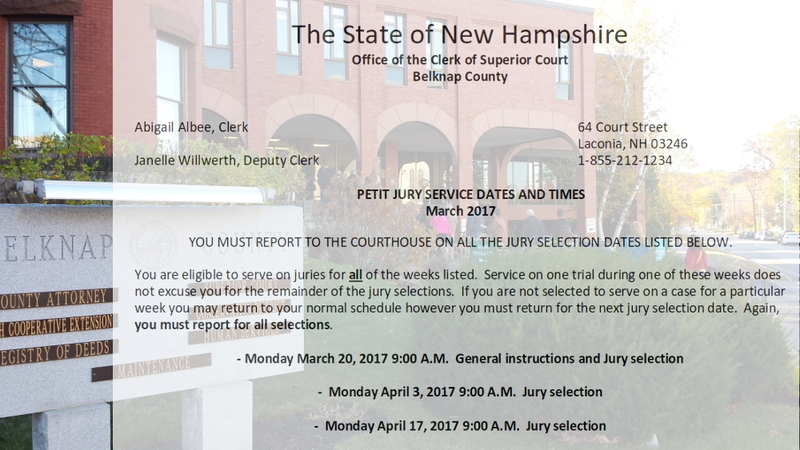 A new jury pool will be starting their service on March 20. We continue the year with Rights Brigade in a juror information blitz. The jury pool is scheduled to return on Monday April 3 at 9:00, and Monday April 17 at 9:00. We will start a half hour before the jurors are scheduled to arrive. At times the jury is dismissed from the secondary dated in the event that trials are postponed. Call the court (1-855-212-1234) to check on the status prior to coming out on April 3 and April 17. A new jury pool will be starting their service on January 9. 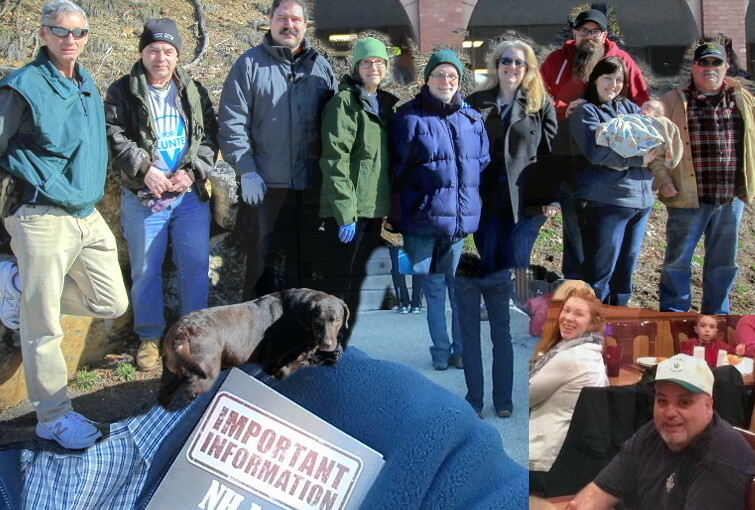 We start a new year and join Rights Brigade in a juror information blitz. For this January 9th selection we’ll need a little extra help on hand. 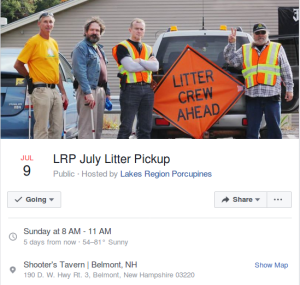 There is a county meeting that will take away one of our regulars, so drop a comment here if you can assist. We’ll be sure to get pamphlets in your hands to distribute. 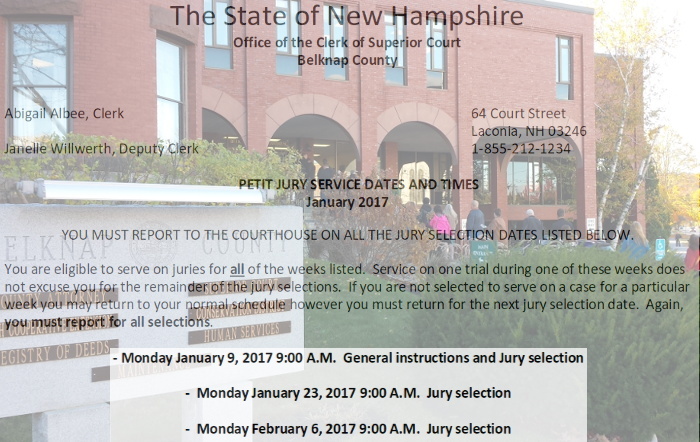 The jury pool is scheduled to return on January 23 at 9:00, and February 6 at 9:00. We will start a half hour before the jurors are scheduled to arrive. At times the jury is dismissed from the secondary dated in the event that trials are postponed. Call the court (1-855-212-1234) to check on the status prior to coming out on January 23 and February 6.